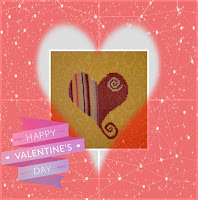 Happy Valentine's Day and welcome to the Secret Stitching Sweethearts Blog Hop. My annual chance to show some stitchy love to our fellow stitchers. Over the last month my inbox has been filled with various lovely stitched and crafted pieces on the theme of Love and Friendship. At the weekend I sent out them to randomly allocated participants who will be showing their Valentines on their blogs today. As the organiser of the Hop I don't get a secret sweetheart but sometimes I still get a heart! The pink cube is the design I stitched last year by Amint Kipatten but the painted canvas and the felt heart are new. They are belated Christmas gifts from the lovely Wee Witchy Steph at Show and Tell. Aren't they lovely? Steph is doing lots of crafting at the moment and makes some gorgeous things. I did receive another gift today but I'm saving that for Gifted Gorgeousness tomorrow. Everyone who is participating in the Secret Stitching Sweetheart Blog Hop will be entered into my Five Hops Challenge this year. But even if you are not a participant you can still be counted for one entry by commenting on this post and letting me know you've been visiting the Sweethearts' blogs. Yes, it's a Chatelaine month! Stayed tuned for progress pictures on Gardens of London. Looking forward to visiting all blogs. 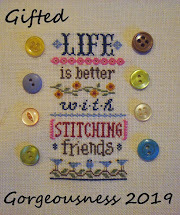 Heart and love are themes which I think stitchers from all over the world like.Waiting to see your GG stitching. I've really been looking forward to this ^_^ I just put up my post and will go hopping a bit later in the day, as I suspect there aren't many posts up yet. About to start hopping around! Thank you for organising another great blog hop! I've put up blog post and will do my blog hop later today. Looking forward to seeing everyone's stitching. I admired ALL the beautiful photos!!!!!!!!!!!! 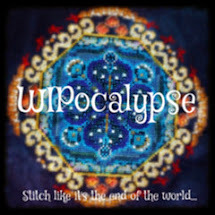 What a great blog hop!!!!!!! Thank you SOOOOOOOO MUCH for organising it, Jo!!!!!!!!! Kisses and Happy Valentine's Day!!!!!!!!!!! I'm on my way to start the blog hop! Just thought I'd say hi, and tell you I love your hearts pictured above! Thanks for hosting the hop...Have a lovely Valentine's Day!! Thanks for hosting. 3 people haven't posted yet and one must have mine. So I will wait a bit and be back. Boy there were sure a lot of beautiful pieces during the hop. Lovely stitching Jo, and nice to see your heart cube again. Great gifts from Wee Witchy Steph! Well done hosting the Blog Hop again this year, I’m off to visit some more blogs. I L.O.V.E the way you listed the blogs. Looks like a bear wanting a hug!!! Too cuuuuuuuuuute!!! Yay, SSBH!!!! Need to make my blog hop rounds to look at some eye candy. London looks guuuuud. Those blues are so scrumptious! A fun blog hop Jo. 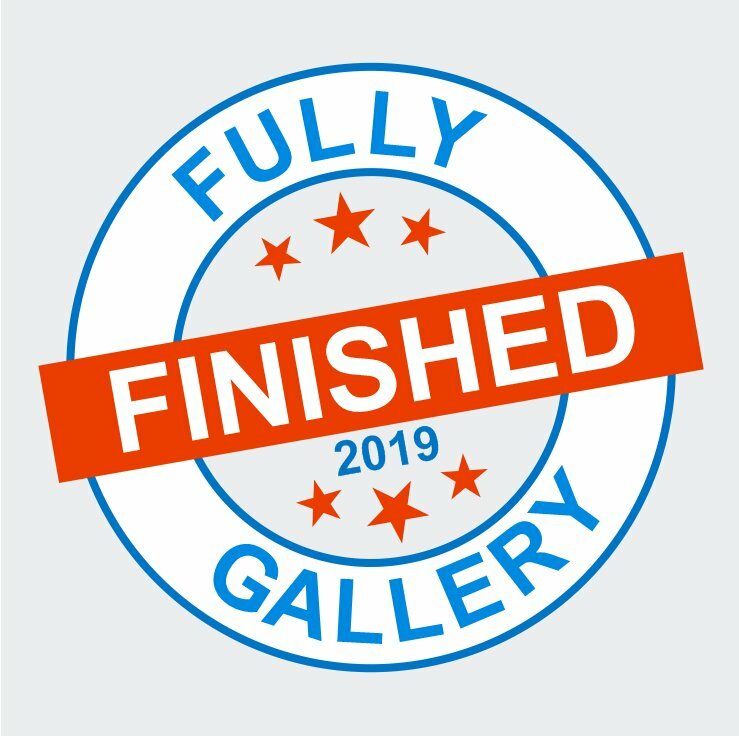 Loved seeing all the finishes. Thanks for organizing the blog hop again! 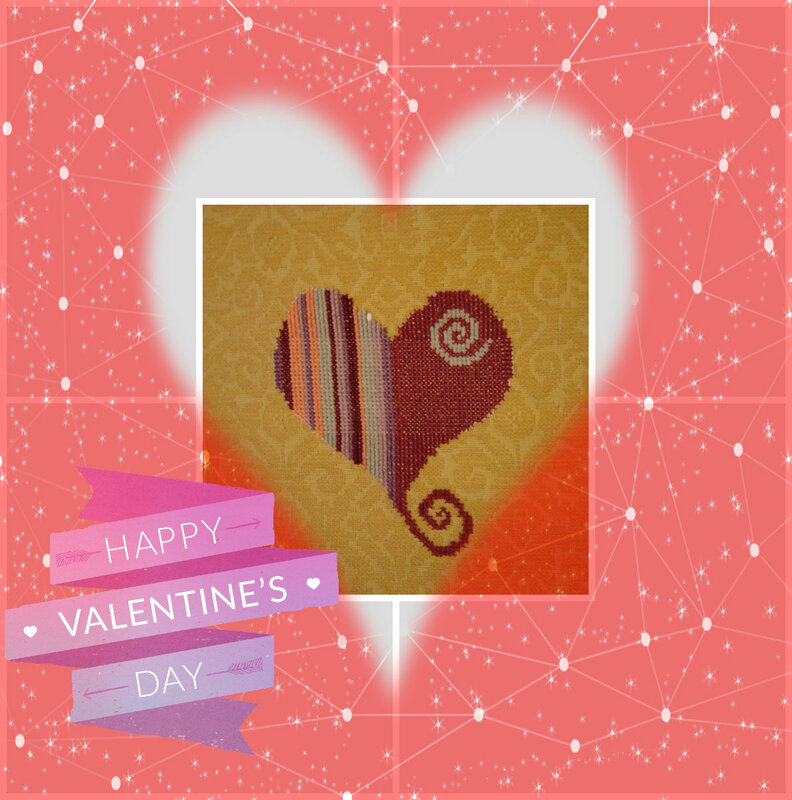 I loved stitching three things for Valentine's Day otherwise I wouldn't.AriadnefromGreece! Just finished looking at all the stitchy love thanks to YOU! Your hearts are very sweet, especially the new ones you received. I noticed the "hug" too, too cute! Wishing you lots of love and hugs on this Valentine's Day! Wonderful blog hop, Jo, I am thoroughly enjoying visiting everyone's blogs and seeing all the lovely hearts. So glad that you own some gorgeous hearts, too. OOh, and clever re the bear hug! Thanks for organizing this hop. Loved visiting everyone....Found my picture. Your hearts are lovely. Have a great day! This was a lovely idea for a blog hop. I hope everyone had a great Valentine's day! I finished the blog hop today as there were a couple I hadn't managed yesterday!That was fun! 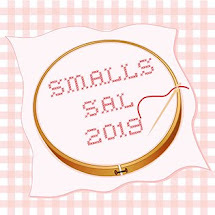 I am so glad I stitched and took part this year and how great to see one more blog from Greece taking part here too!Thanks for the inspiration.AriadnefromGreece! Super hearts you received from Steph. Whew, these holidays need to fall on the weekends more often! It was fun going around and seeing all the hearts worked up for this hop. Steph does make some lovely things. I'm off to hop!